The Cobblers have confirmed they have 22 players under contract for next season - while talks are ongoing with regards to securing the services of three other current squad members. 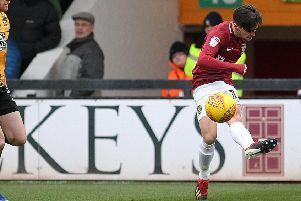 Cobblers caretaker manager Dean Austin met with the players on Tuesday at Sixfields, with the club only definitely releasing three players from the squad which suffered relegation from Sky Bet League One. The three leaving Sixfields are fringe players Kevin Luckassen, Raheem Hanley and Leon Lobjoit, who between them made just four starts and four substitute appearances in league one last season. Hanley has been on loan at Halifax FC since January, while Lobjoit, who was signed last summer from UCL outfit Buckingham Town by Justin Edinburgh, has been playing on loan at non-League side Banbury United. Also departing are loan players Chris Long, Regan Poole and Matt Grimes, who return to Burnley, Manchester United and Swansea City respectively. The trio whose deals have ended, or have clauses, and are in talks about the possibility of staying with the club are Brendan Moloney, Leon Barnett and Aaron Phillips, who has been out injured since August and will be offered the chance to complete his rehabilitation. The club has also revealed that goalkeeper David Cornell has put pen to paper on a new two-year contract, and will be staying at Sixfields until the summer of 2020. Caretaker boss Austin said: “We had meetings with the players at Sixfields on Tuesday and I would like to extend the thanks and best wishes of the club to those who are leaving us. “Talks have begun with Brendan and also Leon. “Leon’s second year has clauses and options linked to it, and with both Brendan and Leon we are looking to see if an agreement can be reached that suits both the club and the player. “David Cornell has extended his contract and will be staying with the club, while Leon Lobjoit, Raheem Hanley and Kevin Luckassen will depart and we wish them well. There is still no news on Austin’s situation at the club, and whether or not he is going to get the chance to take on the manager’s role on a permanent basis. Austin took charge of five games following the sacking of Jimmy Floyd Hasselbaink at the beginning of April, winning two, losing two and drawing one. Town wrapped up their campaign with a 2-2 draw against Oldham at Sixfields on Saturday. Players under contract for the 2018/19 season: David Buchanan, Yaser Kasim, Ash Taylor, Billy Waters, Sam Foley, Kevin van Veen, Daniel Powell, Richard O’Donnell, Sam Hoskins, Dean Bowditch, Aaron Pierre, Shaun McWilliams, John-Joe O’Toole, Matt Crooks, Joe Iaciofano, Shay Facey, James Goff, Luke Coddington, Jack Bridge, Jordan Turnbull, Joe Bunney, David Cornell.